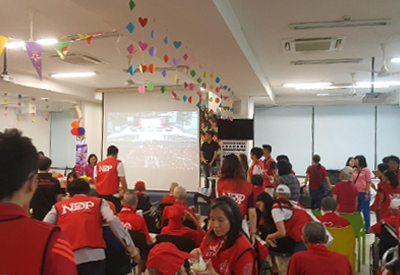 St. Andrew’s Nursing Home (SANH) (Buangkok) organised a carnival to celebrate Singapore’s 53th birthday with its residents. The carnival was sponsored by corporate sponsors such as ACES Seniors, Tan Chin Tuan Foundation and SG Cares. Residents delighted in ice cream treats, teh tarik drinks as well as an assortment of local snacks. They also reminisced fond memories during games of yester-years and a karaoke of famous oldies. Nurses from SANH (Buangkok) even put up an entertaining performance for residents, sponsors and volunteers at the carnival. Patriotism arose among the residents as they became emotional reciting the Pledge and singing the National Anthem. St. Andrew’s Nursing Home (SANH) (Queenstown) joined the Henderson-Dawson community for their National Day celebrations. Ms. Joan Pereira, Member of Parliament for Henderson-Dawson Constituency, was the Guest-of-Honour for two of the celebrations which the staff and residents of SANH (Queenstown) participated in, namely National Day Dinner as well as National Day Observance Ceremony and Community Parade. SANH (Queenstown) choir performed two songs during the Henderson-Dawson Constituency National Day Dinner on 4 August 2018. Mr. Chan Wah Tiong, Cluster CEO of SANH and Executive Director of SANH (Queenstown), and Pastor Abraham Yap, Associate Chaplain, were also invited to join Ms. Joan Pereira and the community in reciting the National Pledge and singing the National Anthem. 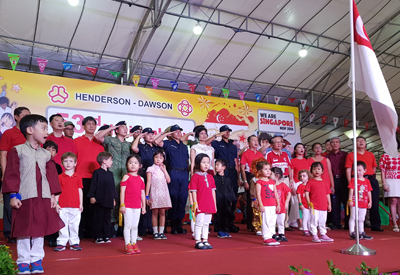 On 9 August, National Day, residents of SANH (Queenstown) participated in the Henderson-Dawson National Day Observance Ceremony & Community Parade. One resident represented SANH (Queenstown) in the pledge-taking ceremony as part of the parade. St. Andrew’s Nursing Home (Buangkok and Queenstown) residents and St. Andrew’s Senior Care (Queenstown) clients were invited to join in the National Day Celebration at St. Andrew’s Secondary School on 8 August 2018. The residents enjoyed breakfast provided by the school and basked in the medley of familiar popular song pieces performed by the school band. They also had a good time engaging in fun games and activities organised by the students. Residents of SANH (Buangkok), sponsors and volunteers celebrated the Nation’s birthday at the carnival. Mr. Chan Wah Tiong, Cluster CEO of SANH and Executive Director of SANH (Queenstown), Pastor Abraham Yap, Associate Chaplain, and the community recited the National Pledge and sang the National Anthem with Ms. Joan Pereira, Member of Parliament for Henderson-Dawson Constituency, at the National Day Dinner. 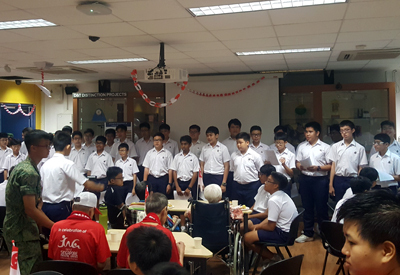 Residents of St. Andrew’s Nursing Home (Buangkok and Queenstown) and St. Andrew’s Senior Care (Queenstown) clients sang songs with students of St. Andrew’s Secondary School.